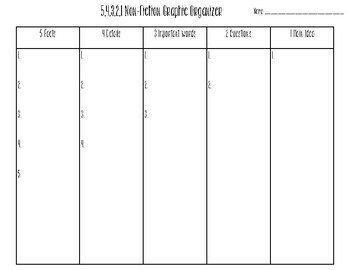 This 5,4,3,2,1, graphic organizer will help students self-monitor while reading. Students will be able to use this resource to respond and analyze a non-fiction while self-monitoring their understanding of the text. This is easily differentiated, and can be used as a great strategy when testing non-fiction comprehension skills.